After over a year of delay since the announcement, Apple finally cancelled AirPower, their multi-device charging pad, based on Qi. 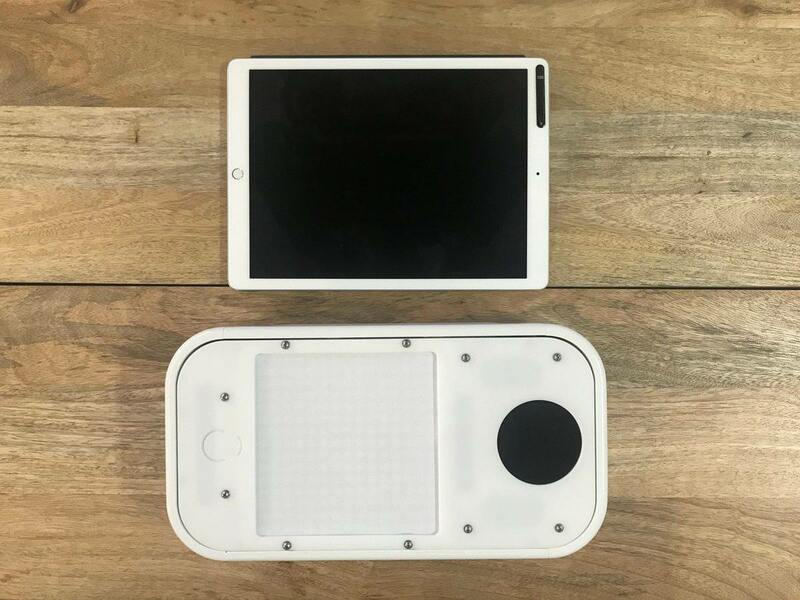 This pad was supposed to be able to charge your iPhone, Apple watch, and Airpods all at one time, just dropping them onto the pad. Qi uses inductive charging to transfer power over no more than a few centimeters, though in practice it needs to be in contact. Qi had some limitations - the charged device needed positioned carefully to ensure good charging, was only one device at a time, regularly managed only a couple of Watts charging, and had something of a transmitter/receiver interoperability nightmare - much of the variability happening due to individual device or imperfect positioning. AirPower was supposed to use Apple's technology and market power to overcome all of those and make it simple, easy, effective. While Qi had some limitations from the initial design, it wasn't beyond the realm of possibility that someone with the pockets and infrastructure to force the market in one direction could make it good enough (even if not perfect). There must have been tremendous pressure within the company to make this work, having made a major public announcement. Apple even spent over $100 million to buy PowerbyProxi, who had claimed to have solved all these issues. Apparently not, and it would be interesting to see if PbP could actually do what they claimed when bought. It's likely heads will roll over something like this, it's a major screw up and not something to be taken lightly. Reportedly, the issue was heating - not enough power getting to the devices, for too much heat in the pad. Those inefficiencies come back to bite you, even if you are willing to pay the $ cost of it. What were the likely tradeoffs? Likely adding many small transmit coils to be able to work with any placements of receivers, while determining it's a genuine receiver and not a piece of metal, while limiting crosstalk between coils, without exceeding FCC limits for safety, while making it a simple seamless user experience. So even with the resources of the largest company in the world, multiple years, working from a known standard, and at zero distance, wireless power beyond the most rudimentary we already have can't currently be made to work satisfactorily for consumers. What does this say about the Energous, Ossia, and uBeam's of the world who want to charge as many devices, at the same charge rate, with new technology at multiple meters? For $100 million, Apple could easily buy one of them to replace AirPower (in face, Energous share price spiked slightly as delusional fanboys claimed this was an opportunity - the same fanboys that likely claimed AirPower had Energous in it when announced...) - yet they don't. What does this mean for wireless charging moving forward? I'd say don't expect any changes soon, but perhaps Apple have learned enough that a future product will be good enough - but no matter what, nothing will ever be as fast, efficient, safe, and low cost as a wire. About 18 months ago I wrote an article on Pi Charging, which used Qi but tried to 'shape' the fields to extend the charging range into the 10s of centimeters, and would work from a cone shaped object that would sit on a bench or table. It seemed ambitious, but not ridiculously so that it wasn't achievable - range was not excessive, charge rates normal for Qi, so I was fairly optimistic they'd get somewhere with it. As recently as 6 months ago they were still promoting it, but it seems the company has now undergone some changes and has rebranded as "Spansive". This is odd, as it's no surprise what the Qi standard was when the company raised its $14m Series A. Next they say they'll be working with partners to licence its "volumetric" tech in specific products, with the usual "wireless headphones" listed. Mentioning licensing without specifics is usually code for "we've got nothing" so I'm not holding my breath here. 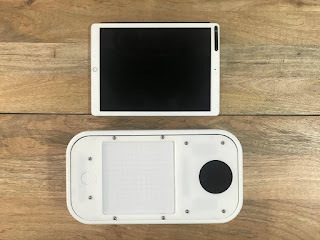 In the blog post, the co-founder talks of essentially a flat plate or container where you can place multiple phones and not worry about orientation, and is Qi compatible (despite the noting of its limits). So... AirPower? Constraining their "volumetric" technology to a plane? Who knows, but there was plenty of waffling and marketing speak to get me concerned - when you say "It will ship imminently" without giving a date, it makes me laugh. Let's see what they do in the next few months. Next I'll try to write on Energous, they continue their downward share price trajectory, have yet to have a commercial product available, and may have even struggled to complete their share offer which, if true, puts them in a position of running out of money in the next few weeks. For 2019, it would be some amount of, if you like, low-volume shipment to innovative customers, first-time users, etcetera, who are trying things. We don’t expect large volume in 2019. In fact, we have shipped already some units, but we’re talking thousands, they’re not millions. A similar situation befell us with the second top-tier opportunity we were tracking for Q4 revenue. The customer was planning a second quarter product launch, which would have triggered a meaningful order in the fourth quarter of last year to support preproduction and initial mass production manufacturing ramp. ... With these changes, we now anticipate the associated chip order will come and ship in the second quarter of this year. We expect to see a number of additional products shipping to the consumer in 2019... A case in point is the fact that we expect to see a number of WattUp-enabled hearing aids from different manufacturers launched to the consumer in 2019. Dialog announce expected volumes of a few thousand units, at a few dollars each? Given this, it confirms my expectations of no leaps in Energous revenue for the next three quarters. The transaction raised $25 million less expenses, which factoring on our existing cash, forecasted revenues, reduced expense budget for the year, should fund the Company for the foreseeable future. Let's be generous and say that the 'foreseeable future' is 4 quarters, in which case they need to cut expenses from around $50 million a year to $24 million a year. In the last couple of years expenses have been roughly $30 million in R&D (mostly headcount, currently 71), and around $16 million in stock compensation. So the CEO and pals can keep their stock comp and slash staff by about 50 people, though that won't exactly look like a company with a future. Alternatively, they could give up 100% of their stock compensation, and only have to lose about 15% of the staff (11 or so). So slash staff, equity comp, or a mystery source of revenue? Hands up everyone who sees this crowd giving up their equity comp, or the magic money fairy dropping a large bag of $ at WATT HQ? Speaking of stock, it is not having a good time right now. Here is WATT over the last year - see if you can spot where rumours of Energous being in the Samsung Galaxy S10 started, and when it was announced that it absolutely was not. My last coverage of Energous was during the Christmas/New Year week when they announced a "new product" that happened to be a rebadging of a previous release from 8 months prior. Now that aside, the key issue for Energous was that towards the end of Q3, they had just under $29m in the bank with $12.5m/quarter expenses, meaning they had 7 months operating capital, and that was 5 months ago... So with a capital raise essential, where does the company stand? It's been 5 months since the last quarterly earnings call (no, that doesn't add up) and since then they've done a rather flat CES, and then a mysterious "oh Energous will be in the Samsung S10" which pumped the shareprice a little. If any of you remember the same game with Apple over the last couple of years that never yielded a product, bonus points to you. Today saw a near 10% drop in the stock price as everyone realized they'd been had - again. So with a desperate need for cash and no sales to speak of, what can Energous do? Cutting expenses will keep it going a little longer, but go too far and no-one believes you have a strong technological future. You have to have products and sales to justify a high share price. Just a reminder of what they said in the earnings call in February 2018. We expect the first contact-based transmitters will be in the hands of the consumers in early 2018, followed by the first at-distance transmitters coming in late 2018, culminating in far-field transmitters coming to the market in 2019. We're heads down focused on commercialization, and we believe that the $40 million is sufficient capital to get us to that point (profitability). Yes, it's clear they were wrong in every single part of what they said there. The main method that the company can use to raise is to issue more shares in the company (diluting existing shareholders) and sell to the market. The amount of dilution will depend on the raise, and the share price sold at, so it's in the company's interest to pump the stock as much as possible prior to a sale - I cover here a few of the tricks they do regarding that. With $50m a year in expenses, the $75m sale they registered for last year will, at best, do them 18 months without further revenue - and there's no chance of significant revenue in that time without products. So, they have to give the idea that they will have significant product sales in 2018 and 2019 to support that, given the long-distance wireless charging is at least 18 months out (and IMO will never be released, it's pointless). So a few points here - first of which is they are literally labeling it a hearing aid! It's written on the base unit and the specs reference hearing loss, so hardly any way to avoid breaking regulatory limits if it's sold in the US. Next, we finally have some data on charging - 3 to 4 hours charging for 15 hours of use, using a Li-Ion battery. Great, now Li-Ion batteries are at 3.6 volts (regulated down to the standard 1.4v for your regular zinc-air hearing aid batteries), and they can't yet be made in the small hearing aid packages, so more like a size 13 package. (Hearing aid batteries come in 4 sizes, size 13 is the 3rd largest). Data here indicates that it's around 42 mAh 'effective capacity', compared to around 310 mAh in a standard size 13 battery, barely 15%. Interestingly this site also indicates that there's around a 30% reduction in capacity after 6 months of daily charging. It's going to be annoying charging for 3 to 4 hours for 10 hours of use, and remember because these are Li-Ion they are sealed in the package for safety. Most hearing aids draw around 2mA, so at about 70% efficiency that gives around 15 hours of use, matching the numbers above. Now convert that to Watts, and 1.4 volts and 42 mAh means around 60mWh, and at 3 hours to charge, that's about 20 mW charging. Ouch - even if I were generous and said 3.6 volts that's 150 mWh so 50 mW charging. If that's the standard charger that emits 1 Watt, it's around 2 to 5% efficiency. If that's the best Energous can do with their receiver chips, it's somewhat embarrassing even for them. Sad for a company that only a few years ago claimed it could send power to phones at over 12 feet and up to 4 Watts. I'm also not sure how this product can be sold, in the US at least. Where's the FCC ID for the transmitter and receiver? A search of the FCC system shows no new IDs for those companies. Any regulatory approval for other countries? Now is this a revolutionary product that will delight users? Nope. Here's Signia's Cellion, with rechargable batteries, a docking station with inductive charging, and claims 50 mAh, 1500+ recharges, 7 hours of use on a 30 minute charge, 24+ hours of use on a full charge, and announced in 2016. (And, unlike PSAPS, these are hearing aids). So well done Energous, you fail to match every specification on a near 3 year old product. I need to go look up OSHA rules on RF exposure now. Regardless, IMO this will never come to fruition as a product for consumers. It's not safe, and will never meet regulatory compliance. It's just another way to fool people without any in-depth understanding of the technology. Is this why they delayed the earnings call, so they could show off something that will never meet FCC compliance in another country? Anything to push that stock price up. Finally, Energous announce they'll be in a phone. Energous Corporation the developer of WattUp, a revolutionary wireless charging 2.0 technology, today announced a collaboration with vivo Global, a leading Chinese technology company, to explore integrating WattUp into smartphone designs that charge wirelessly over-the-air. Well, no. They announce a "collaboration" with vivo Global, to "explore the use of WattUp", so basically nothing. One of my earliest articles on Energous was how they use carefully worded announcements to let the reader make inferences that aren't in fact there. Like everything Energous, it will utterly fail to meet the expectations set, other than to boost the stock price temporarily. Further, don't Energous often make reference to a "Tier One" vendor contract (often intimating that it's Apple) that have restrictions on who they can work with? If so, then the Tier One agreement is no longer in place, or the Tier One isn't a phone company. Either way, not good for Energous! The Q4 2018 earnings call will be this Wednesday 27th, in the morning US time (5.30am Pacific) as the executive team is at MWC. I'm looking forward to how they spin all this, I'm always amazed by the true genius (and shamelessness) of Energous in how they keep this thing going. It has to end one day, but they seem to be able to get blood out of a stone better than anyone. The amazing story of a founder who with no experience but grit, determination, financial security, and a healthy sense of hustle, raised $60 million to solve the biggest problem she could find. Once you've watched it, read the reaction the author got to the performance in this LinkedIn post. Exactly 7 days before the October TEDx event in Oakland, the event organizer put out a call to Bay Area comedians to perform a 7-minute set at TEDx that weekend. Instead, I pitched him a character I’d been working on: a Frankenperson cobbled together from the stories of every out-of-touch startup founder and thought leader cliche I’d seen during my time in the tech industry -- complete with brightly-colored blazer. He agreed. Though, in hindsight, I don’t think he knew what he was signing on for. Edits and update, 10th Feb 2019: Upon further investigation and discussions, it looks like the website in question was not an official uBeam attempt at astroturfing, but a genuine effort by individuals to promote women in technology that ended prematurely in large part due to my blog post. While it highlights the rule of "never use company resources for non-company activities", those involved should be commended for promoting role models in an under-represented group (though clearly I'd not personally choose Perry as a role model for anyone). I think this post does make some important points on how companies can and do use PR (and clearly on how company history affects current reception) so while I won't delete the post I have made some updates to reflect this new information, I'd ask that everyone view the original website, and its creators, in the positive spirit that was intended. Astroturfing is the practice of masking the sponsors of a message or organization (e.g., political, advertising, religious or public relations) to make it appear as though it originates from and is supported by grassroots participants. The founder of Red Hat (now a ~$25 billion company) needed to gain credibility for his product, so he essentially gamed a 'study' of high Linux user growth, and got a small Linux journal to quote him. Then he managed to get BusinessWeek to quote the Linux journal, and suddenly this made-up statistic had all the authority of being stated in a prestigious national publication. He abused the lack of fact checking and diligence to plant an idea in the media as if it had substance, and used that to help promote his own company. Have you seen a prototype? No. I trust her (Perry) enough that I haven’t gone out and said, ‘Show it to me.’ She’s shown it to enough people that I trust what’s going on. So he'd not seen a prototype, or from this sentence spoken to anyone else that had, but invested on the premise that someone else must have. I'd be interested in hearing from any of those people she'd shown it to. This quote is from July 2015, and in a recent interview Perry admitted that no charge had ever been transmitted to a phone until 6th Dec 2016, nearly 18 months later. Hmmm. One thing a startup often relies upon is the "Myth of the Founder", and in many cases this serves the company well, at least for a time. With Theranos, Elizabeth Holmes was lauded almost right up until the SEC and DOJ pressed charges against her (and in the case of investor Tim Draper, long after), while Tesla sees great publicity, headlines, and stock performance due to the media presence of Elon Musk, though that has not been as effective recently. When the company has little in the way of product, puff pieces on the founders can still generate great publicity for the company. uBeam co-founder Meredith Perry was a great example of this, for example with this article from Fortune magazine in July 2015 entitled "Is this woman the next Elon Musk?". Now the value of that headline for any tech company, regardless if the answer is "OMG no are you smoking crack?" or not, is incredible. Fortune magazine said it, so it must have some truth to it. Interestingly, despite the positive headline, the story itself contained a skeptical paragraph. So again, a working prototype claimed in late 2014, but how does that mesh with the "first charging in Dec 2016" statement? At least the journalist had the sense to ask for a demonstration, and indicate it wasn't shown despite its ability for a Damascene like conversion. Regardless, how many will remember this, and how many will simply look and think "Next Elon Musk!"? Priceless PR, and something any company should aim for. Overall, at least in the moment, PR done well. Now you may remember that Perry 'stepped down' as CEO of uBeam last year, and so it was interesting see recent coverage of Perry as a leader in technology. The website, Women in Technical Leadership, features Perry as their first, and currently only, woman who has made an impact in STEM. (Update, taken down as of 31/1/19, you can find the archived versions here and here) Now this is a laudable goal, as women are dramatically underrepresented in technology, and anything that encourages more women into STEM fields, at all stages, is to be encouraged. So what are some of the things it says about Perry? In the early stages of her career, Meredith Perry has given a TEDx talk on how to be a technology innovator which IEEE boasts as "amazing" and certainly proved you do not have to be an engineer to create something. While Forbes has compared her to the likes of other entrepreneurs, she is in a league of her own that is near impossible to match. We celebrate Meredith Perry for being an exceptional role model to young women everywhere! To find out more about Meredith Perry's company, visit www.ubeam.com. Women in Technical Leadership is a culmination of engineers wanting to highlight the selected woman's accomplishments and make their achievements better known. Sponsored by a start-up in Marina Del Rey, the staff have decided to examine the women from the region of Southern California. Marina Del Rey? Why is that familiar? Perhaps it's because uBeam is based at 4086 Del Rey Avenue, in Marina Del Rey. Oh. Let's delve a little deeper and take a look at the "Get in Touch" button which sends to an email at... ubeam.com. And a look at the WHOIS registry for the domain name, it was registered on the 15th January 2019 to uBeam, Inc. So has uBeam has started a website for women in technical leadership which is fantastic, praising their own co-founder, but for some reason not prominently mentioning it's a uBeam owned site, which is a reasonable disclosure to make? If so, some might call this astroturfing, where an organization tries to make it appear the message they want out has come from an independent person or group. Further, why would the new CEO, who had barely been on the job for two weeks, start a website to praise his predecessor, when he needs to be making product, licensing IP, or selling the company? Hardly something worthy of their efforts. And if not his doing, or official uBeam PR, then why does it use uBeam email and uBeam Inc as part of the operation? It's not like you need a company to get an email, register a domain, and start a website. The new CEO is, for some reason, spending time, effort, and money promoting his predecessor, in a way that gains publicity for his company, but not overtly declaring that relationship. It's an official uBeam PR attempt from a few months ago, only just becoming public. So next time you read such positive publicity about a founder, or anyone else, take a look at who is behind it, it might be quite illuminating. Own it, get out in front of it. Revamp the page to make it clear and unambiguous it's uBeam owned and sponsored, and do some blurb on how awesome the co-founder was and the company now wants to give back to the community and help women in tech based on her example (losing the SoCal restriction). I'd task the employees who were responsible that they need to be working on this and get a new person featured each month, in addition to their normal jobs, and have them supervised by someone with actual PR experience. And I'd have each of the featured women be able to allocate $5,000 from uBeam to a relevant charity of choice, get quotes from them, and then use that to get features in other publications and low cost PR. If asked why the original looked the way it did, I'd just say it went live early by accident. If it doesn't work out, drop it after a few months, as no-one noticed anyway. Update 30th Jan 2019: I'd originally titled this "Hagiography: a pejorative reference to biographies and histories whose authors are perceived to be uncritical of or reverential to their subject", but I felt "Astrofurfing" was a better term. Update 31st Jan 2019: WOT Website has been taken down. This is a post for references, there's minimal commentary, just links for ultrasound in air background reading, regulatory and safety and a few notes on each. I've previously commented on ultrasound in air and safety considerations across multiple posts, but I wanted to put together a post that will contain relevant information in a single place. I intend this to be a 'living post' and will be updated as more documents/regulations are included, or regulations are updated - so it's a work in progress. If you're knowledgeable in the field and have a reference I should include, please let me know by email or in the comments. Are some people suffering as a result of increasing mass exposure of the public to ultrasound in air? by T.G. Leighton. A great starting point as it covers the history of ultrasound limits in air, details of possible adverse effects, and with recommendations for further study and safety considerations. An extensive list of this author's work, including further research on ultrasound in air, can be found here. Wireless Power Transfer to Millimeter-Sized Nodes Using Airborne Ultrasound by Angad S. Rekhi, Butrus T. Khuri-Yakub, and Amin Arbabian. Detailed, peer reviewed paper published in Transaction on UFFC in 2017, best paper to date on the topic. Indicates microWatt level power transfer viable. Damage to human hearing by airborne sound of very high frequency or ultrasonic frequency by B.W. Lawton for the Health and Safety Executive in the UK, a literature and standards survey in 2001. A Review of Current Ultrasound Exposure Limits, Carl Q. Howard, Colin H. Hansen and Anthony C. Zander. A 2004 study which concludes "Until more definitive data become available, it is recommended that the more conservative standard proposed by the Health Canada  and listed in Table 1 be adhered. This means that sound pressure levels should be less than 110dB above 25kHz, regardless of the exposure duration, to prevent the undesirable subjective effects of ultrasound." Effects of Ultrasonic Noise on the Human Body—A Bibliographic Review Bożena Smagowska. A review of other ultrasound safety papers, with the following quote "According to Allen, Rudnik and Frings, a mouse dies from overheating after 10 s to 3 min of exposure to a signal of 20 kHz and level of 160 dB . According to Danner, a lethal level for signals of 18–20 kHz for an unshaven mouse were 144 dB and for a shaven mouse 155 dB . Acton obtained similar results and extended studies to larger animals such as guinea pigs and rabbits ." Guidelines for the Safe Use of Ultrasound: Part II – Industrial and Commercial Applications by Environmental Health Directorate Health Protection Branch, Canada Canadian guide to potential harmful effect of ultrasound, with the quotes "In addition, Acton (Ac 74) has reported on unpublished work by Parrack indicating that mild heating in skin clefts has been observed in the SPL range of 140-150 dB... It is plausible that chronic lengthy exposures to levels between 145 and 155 dB might also be harmful, as they could raise body temperatures to mild fever levels during the exposure periods. 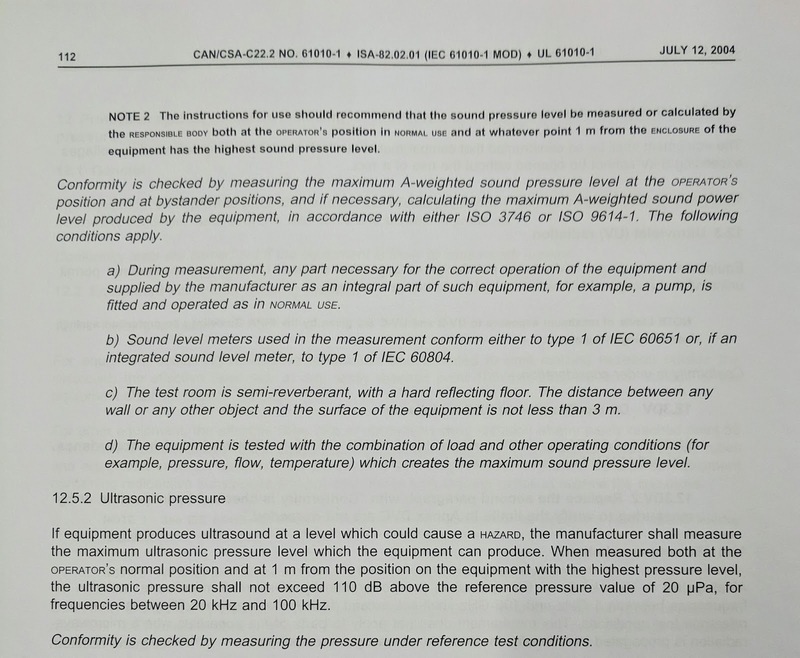 However, as indicated in Section 3 of this guideline, such high sound-pressure levels have never been encountered in either commercial or industrial applications... However, in the ultrasonic frequency range, if potential problems due to heating are to be avoided, total linear measured SPL exposure to other parts of the body must never exceed 137 dB. This value is based on the lowest value (140 dB) (see Figure 2) which allegedly has led to mild heating of skin clefts. A safety factor of 3 dB (a factor of 2 in energy) should ensure that no significant heating of a human could occur." Environmental Health Criteria: Ultrasound. 1982 WHO summary of ultrasound limits and safety studies. OSHA and Global dB limits. Covers Occupational Safety and Health considerations, and shows a limit of 115 dB above 40 kHz in the USA for the workplace (not home, consumer etc exposure). No mention of a 145 dB limit. Notes limits around the world are between 110 and 115 dB. Underwriters Labs (UL) Testing. From UL's website "UL helps companies demonstrate safety, confirm compliance, enhance sustainability, manage transparency, deliver quality and performance, strengthen security, protect brand reputation, build workplace excellence, and advance societal wellbeing". This is a standards document you need to purchase to read in its entirety, the relevant section is 12.5.2, a pic of that section is below. Limits SPL to 110 dB in useable area of most devices. "Manufacturers of electronic products listed in table 1 of this section if such product is sold exclusively to other manufacturers for use as components of electronic products to be sold to purchasers"
essentially, if you sell parts to other companies, you don't need to go through the FDA, but whoever sells the final product will. International Non-Ionizing Radiation Committee of the International Radiation Protection Association. (INIRC-IRPA). 1984. Interim guidelines on the limits of human exposure to airborne ultrasound, and concludes the general public should not be exposed to ultrasound at levels above 100 dB regardless of frequency. Health Effects of Ultrasound in Air (HEFUA). "HEFUA is the UK consortium (encompassing researchers, clinicians, policymakers, and the public) that addresses the fact that humans are being increasingly exposed to ultrasound in air through commercial devices. There is insufficient understanding of how these devices affect health, even when exposures are known." This page also has links to multiple documents on ultrasound in air. Subharmonic Distortion in Ear Canal Pressure and Intracochlear Pressure and Motion by Stanley Huang, Wei Dong, and Elizabeth S. Olson which looks at the generation of subharmonics, that is frequencies lower than the transmitted sound, in the eardrum from high intensity ultrasound. Acoustic Weapons - A Prospective Assessment by Jürgen Altmanna. A good summary of ultrasound used as a weapon. There was a brief video published today interviewing the uBeam Director of Product Marketing and Management at the floor show in CES (not the private suite), by MacVoicesTV. What you see is quite limited, a receiver only, no transmitter (except off camera, and on the screen behind), but interesting nonetheless. There are a few things that stand out in this video, and I'll start with the interviewer. Now I know this is not meant to be an in-depth technical expose, I'm eternally frustrated at the terrible coverage tech gets, but this was little more than allowing uBeam to read out their marketing material unchallenged. What is the point of the interviewer if they don't add anything to the mix? He does say "I wouldn't be doing my job if I didn't ask about safety" and then lets them go wild with, IMO, very suspect safety statements (more on that later). After that, nothing that his job actually entails such as asking about power transmitted, delivered, cost, efficiency, product release date, regulatory approval - anything of practical interest. He was basically pointless, and should have just handed the mike to the PR guy and cut the pretense he was doing anything at all. Now the demo itself did yield some interesting info. In the background the poster claims "Useable Power, Meters (away? )", so definitively claiming >1 meter here. The receiver shown lit up - an LED - so a whole few mW of power has been received. Distance from the transmitter is not shown, but likely a meter or so. So much for phone charging if that's all they can do, and you have to think that if they could do more, they absolutely would be showing that. For tracking, the target seems to need to be within a box of reflective tape, that is 1cm or so wide. That places quite a requirement on the border of the target, on top of the multiple centimeter sized cylinders for reception. How will this targeting work if some of the square is obscured? Might be a problem for a handheld device if the user isn't allowed to hold it. Seems a pretty 'ghetto' marking method for consumer electronics, that is not IMO going to fly in any real product. The transmitter following the receiver was shown to have a short lag each time it moved - is the beam still on and insonifying something else during that time, or switched off? Last question on tracking - is there any feedback so the transmitter knows how much power to send, or is it just full on, all the time? If there is, what's the communication method? While the transmitter isn't shown in the video, in the background a video seems to indicate they are using transmitters like the ones shown last year. Shown in the upper picture next to an iPad, and the lower one marked as "March 2018". That looks to be about 16 by 16 Murata style devices, each around 1cm in diameter, so 256 elements total and at 145dB (290W/m^2, intensity claimed by uBeam in the past), that would mean around 7.5 Watts acoustic out absolute maximum. If all of that were lighting a, generously say, 100 mW LED then that would mean around 1.4% acoustic to electrical conversion, though when you account for efficiency in the transmitter would drop below 1%. They go on to say that they are so awesome for Industrial Internet of Things, low power sensors etc, that's where they are focusing and save everyone the frustration of changing batteries - for the addition of white tape and large receivers around all the sensors, a power bill going up 100x, and only one lunchbox sized transmitter per few sensors. Given that Powercast already sell a wireless power system that will work at up to 80ft, with regulatory approval, can charge at up to the mW level, and does not need large receivers or reflective tape, I'm not quite sure what the value proposition here is. A 'more robust' version of the demo was being given in their suite at the Venetian, so apparently this demo was not robust. They'd power cameras and sensors, but no mention of phones, which indicates to me that they can't reliably get 500mW to 1W at a phone sized receiver, as generally that's the minimum needed to even start charging a phone. All acoustic energy bounces off the skin This is true, you get around 99.9% reflection from bare skin into the air - however - once there is hair on that skin, then acoustic losses go up, and that acoustic energy is converted to heat. Put enough energy there, and it can heat up a lot. Some papers report that mice and rabbits can die from exposure to sound at 145dB and up. From "Effects of Ultrasonic Noise on the Human Body—A Bibliographic Review"
"According to Allen, Rudnik and Frings, a mouse dies from overheating after 10 s to 3 min of exposure to a signal of 20 kHz and level of 160 dB . According to Danner, a lethal level for signals of 18–20 kHz for an unshaven mouse were 144 dB and for a shaven mouse 155 dB . Acton obtained similar results and extended studies to larger animals such as guinea pigs and rabbits ." Now at 145dB temp rises can be small, but cumulative, and consumer devices have to cover edge cases like babies, drunks, ill people who can't move, pets locked in cages etc. When you sell millions of devices to consumers, who do things they shouldn't, your system has to be foolproof. I'm wondering, if it is pointed at the ear canal, does it work differently in there, where there is a very sound sensitive part? Any sub-harmonic generation possibilities, where a lower frequency that what is transmitted is heard? (For example, a subharmonics of 40 kHz are 20 and 10 kHz, both in hearing range of some to pretty much everyone). I'm sure that was studied too. We've had 3rd parties evaluate our system over 18 months and it's completely safe including for pets There is a lack of evidence in the literature that ultrasound in the environment at these amplitudes is safe, and if they have it, this would be a landmark paper that would be massively valuable around the world. I'm sure there was a scientifically controlled experiment, repeated multiple times for statistical significance, followed over years, and if people were involved (which to study human hearing or skin response there would have to be) there will be an ethics review somewhere too? Please write a paper, for peer review, and all critics will be silenced. So come on uBeam, release the study - it doesn't have to reveal anything about your system, or technology, just the effect of sound. There's no commercial reason to keep it hidden, no competitors that will steal a march on you with it. All it can do is benefit you - so release it. Or is it not quite that good? Tim Leighton from University of Southampton did the most comprehensive study to date on the effects of ultrasound in the air I know of. You can read it here, and it is not at all as confident regarding safety effects, especially long term. The beam is controlled and directed If the wavelength of sound is smaller than the pitch between the transmitting elements, there will be what are known as 'grating lobes' where energy is sent in directions in addition to the desired beam. Given the spacing seems to be around 1cm, and at uBeam stated frequencies the wavelength is smaller than this, there will almost certainly be grating lobes. If so, how many people walking past that demo were getting insonified? That is pretty appalling to me - that members of the public, without their knowledge, could be subjected to unknown sound levels that may or may not have regulatory approval. Which brings me to the next part of safety. Regulatory. 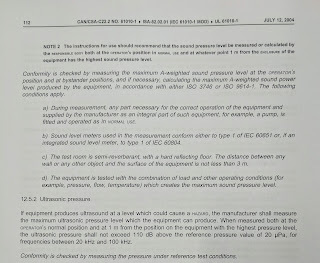 OSHA used to have a limit of 145 dB for sound above 40kHz in air (US only), however a look at the rules today appears to show that it's a flat 115 dB, 1000x less power. Other countries are all in the 110 to 115 dB range. The FDA requires approval for all radiation emitting products, while UL 61010-1, Section 12.5.2 "Protection against... ultrasonic pressure" says "the ultrasonic pressure shall not exceed 110 dB above the reference pressure value of 20 microPa for frequencies between 20 kHz and 100 kHz"
So it seems that OSHA, the FDA, and UL all require much more stringent safety than simply blasting 145 dB around. This will be answered in that 3rd party set of tests, right? Again, no problem releasing this as there was a claim in the Oct 2017 fundraising deck that uBeam was "legally approved by FCC/FDA". When it comes to regulatory and safety the burden is not on the regulator to prove it is dangerous, it is up to the proposer to prove that it is safe. "to hold paramount the safety, health, and welfare of the public, to strive to comply with ethical design and sustainable development practices, and to disclose promptly factors that might endanger the public or the environment"
So sell anything you like, fools and their money are soon to be parted, but prove that it is safe and don't ever put the health and welfare of people at risk. If you do, don't call yourself an engineer. Update Jan 19th: Confirmed that it is the white box transmitter. The transmitter was on a motorized rotational stage, turning an estimated +/- 45 degrees to steer the beam. If that's the case, I do not understand why they bother with individual elements and a phased array - just get a focused bowl arrangement and steer mechanically, it would be simpler and much cheaper. The CES floor show demo seemed to show phased array operation, so perhaps there's a very limited steering angle and gross motions need mechanical steering? There were items taped to the wall, on the door etc to show charging of items like "smart locks", however the device itself never charged, it was always an LED that lit up to indicate power was being delivered. That means it could be as low as around 20 mW received. Those who held the next generation transducers seemed to think them roughly the same lateral dimensions as the Muratas, perhaps a bit thinner, but nowhere close to the "4x smaller area, 100x thinner" listed in the Oct 17 fundraising. They did say that the demo was being done with COTS devices. Generally the view was that the presentation materials were not particularly professional. Given what they showed, it seems they booked a slot at CES prematurely, I have to think this hurt more than helped - but maybe I'm just a dumb engineer. uBeam started 2019 by giving some private demonstrations of their wireless power transfer system at CES, which according to their PR material "using proprietary transmitters and receivers, uBeam is able to deliver the necessary power to charge a range of devices from portable electronics to IoT sensors at various distances" which manages to set no expectations or give any real indication of what it can do, like any good PR should (unless it truly can do something useful!). It's that magical 18 months again - nicely chosen in the past to be just out of firm memory, and for the future far enough away everyone has forgotten by the time you get there. Company pictures and LinkedIn do not seem to support 30 engineers, more like the low 20's and not all of them will be engineers. 100 patents and applications seems high too, unless a very large number have been submitted in the last year and are still not visible to the public, or they're double counting international applications. Press - next time you speak to the CEO, maybe ask for the patent list and an actual headcount? And reference design kits in the next 12 months? Those will be interesting to see. So what's the new CEO's background? He's actually a well qualified person for the role and IMO finally sees someone competent in the big chair at uBeam. McElrea joins uBeam having served as CEO of Semblant Ltd. since 2015, a UK and Silicon Valley based B2B nanotechnology company which was acquired in Q4 2018 by HZO, a global leader in electronic material technologies. Prior to Semblant, McElrea was Vice President of IP, Licensing and Marketing at Energous Corporation, a San Jose based wireless-charging company that completed its IPO in 2014 and was awarded “Best of CES” in 2015. McElrea was responsible for the marketing, patenting and licensing strategy, as well as initiating FCC engagement and the formation of the “Uncoupled” wireless power standards committee within the AirFuel Alliance. I just about fell off my chair laughing when I read that - long time readers of my blog will know I've been covering Energous extensively, as another at-distance wireless power company that many describe as a straight up scam. I started covering them back in 2016 in-part because I could go into details about the RF power delivery method Energous use, pointing out the basics of physics that limit them, many or all of which also applied to uBeam, without risking breaking my NDA with uBeam. I've said before I think the genius of Energous has been in repeatedly raising money from markets despite IMO having little to nothing, not in any of their technical work, and much of that came from IP, licensing, and marketing. If uBeam are in the position that they have as little technical capability as Energous to charge a phone safely, then expect them to follow the Energous path for PR, product announcements for 18 months out that never happen, mysterious deals with Tier One vendors that can't be divulged, and similar. They've already stepped back from the multi-meter, multi-watt, multi-device claims and are covering "IoT" only now - what next? While uBeam can't tap the IPO market the way Energous smartly did early on, there are still fools out there who might think this is a worthwhile purchase. Will we see uBeam sold "for an undisclosed amount" in the next year? I expect that will be a high priority for the new CEO - put a pretty bow on uBeam and get it sold. Or should I say lipstick on a pig? 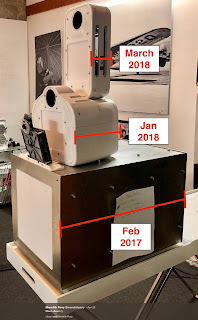 That was going to be the full extent of this post, until earlier today the EEVBlog posted a very interesting picture of uBeam's CES 2019 demo kit. Now I know as much as you do about this, but if this is the whole demo, it's failing to meet even the low bar I had set for them. If this is it, what you see in that photograph is the result of nearly $40m of investment to date, and around 5 years of work. The three boards in the box with the circular components in grids are the transmitter or receiver transducer boards, and it looks very much like they are still using standard Murata transducers - basically the devices that work as car parking sensors in most vehicles. Why are some white and some black, I'm not sure, they may be the send and receive versions that Murata have, or simply someone has removed the thin grill from the front face on some. The two rectangular boards seem to be about 14 by 8 cm in size, so roughly the same size as an iPhone X.
Dave Jones on EEV Blog points out in the bottom left is a rather unsafe looking power supply, maybe around 100W or so, with the energy harvesting boards in the bottom right that might get mW out. (Update: The bottom right board is a "Burst Circuit PCB" and you can order it from here (link now inactive). Thanks EEVBlog.) If that's the case, it would point to efficiency being in the 1% or less range. The white frame in the top right may be part of a vision tracking system now shown to be a receiver to light an LED, he notes the white squares are reflective material used to locate and track the board for power delivery, and the top left board looks to be an Intel MAX10 FPGA which can do beamforming calculations (when each element has to be driven to steer in a particular direction). As far as I can see, there are no custom parts in that box, most of it is Commercial Off The Shelf (COTS). Maybe there's a large transmitter somewhere, like we've seen before, at 45 by 45cm or 60 by 60cm, but even with that, I'm really not wowed by it. Interestingly, during the last fundraising for uBeam over a year ago, their pitch deck became public, and some of it was shown on the EEV Blog. This slide makes it clear that uBeam, at the time of their pitch in late 2017, were claiming to have transducers that were smaller, thinner, more powerful, and much cheaper than the "market transducer". Except a year later they're doing a demo with a "market transducer". That's pretty embarrassing for what they themselves describe as "uBeam's most critical component". And how does this match with charging "Internet of Things" electronics? Does each need a board that's 14 by 8cm? Or do they each get a Murata sized can transducer that essentially takes up a 1 cm cube, and receives 1/100th of power of those boards? What of the potential partners and customers from that pitch? Were any of those multi-billion dollar companies there to say that yes, indeed they would be partnering with uBeam? Or a year later are each and every one of them unconvinced? And what of their claims, back in Oct 2017, that they could charge a phone at 1 meter at up to a Watt, already approved by the FCC and FDA, with no safety or interference risks, and a small receiver? So in summary, uBeam showed (at least from this picture) nothing new, and in fact looks to be steps back from what was claimed already complete in 2017 during fundraising, but now have a competent CEO that's been at the heart of a similar company who raised hundreds of millions on not much more than uBeam appear to have, and likely has a big financial incentive to get it sold. 2019 might be more interesting than I thought. More on uBeam's CES 2019 in a further post here. Former employee posts a negative company review on Glassdoor where they describe the experience as "Like being paid to sit and witness the ramblings of the mentally ill"
My last few posts have asked where the FCC approval for the recently announced product was, as it wasn't showing up on the FCC search site. While the FCC site doesn't have it, it can be found at a different site and is ID VAW-NF910. It is indeed by SK Telesys, was granted on Dec 27th, and is for wireless charging under FCC Part 18. Reading further though, it's clear this is not a new product, but rather simply a renaming of an earlier near field charger, the 2ADNG-NF230. If it's been approved since April and is awesome, why can't I buy it yet? I did a full post on this 'product' back in April and I was as unimpressed then as I am now, I titled it "Energous FCC Approval Shows Weakness of WattUp Technology". Basically, slower than Qi, with further safety restrictions and less compatibility. There are already Qi based charging cases for earpieces, why is this any better? Or should I instead ask, why is this not worse? The user manual for the 2ADNG-NF230 is here, and the FCC Approval from April 9th 2018 can be found here. Below are pictures of the device and antenna from those documents. The NF-230 Charger requires all persons to be at least 10 cm afar from the charger at all times except when placing or removing the device to be charged. Don't sleep too close to it! With one antenna active at a time, it's 29dBm output so just under 1 W transmitted. They maintain the SAR limit (1.6W/kg) at around 0.86W/kg, so judging by the previous Part 18 approved device which was similar output after the safety cutoff zone (though 10W transmitted), we can probably expect no more than 200 mW of received power, and after conversion from RF to DC down to around 100 mW at most. Interestingly, if SK Telesys and Delight are simply rebadging existing Energous applications, there is no current FCC Approval for a receiver for this, so the transmitter can send, but there's nothing to take the power. The only parts in the same frequency range approved are the larger sized transmitter (2ADNG-MS300), and a phone sized receiver (2ADNG-MS300A), and are not appropriate for this. I would give some comment on their DA2223 chips and what they might be able to do in a receiver, but unlike regular electronics, the vendor provides no data sheet, only marketing level material. Without receiver approval, there's no product here! And doesn't this mean that a statement like "FCC approval of the Delight PSAP hearing device" in the press release is a bit of an exaggeration when it's a charger that's approved, not the PSAP? There really needs to be another approval somewhere we've not seen. Well done Energous, great marketing hype given there's absolutely nothing new at all. What did that do for your share price? Oh, a bump and back down 40% from there. I hope the insiders managed to sell at that high - we'll see in a few days if they do.